For many years I listened to friends with daughters complain about the daily wardrobe battles they have with their girls. “What’s the problem?” I would say, “Just lay out their clothes in the morning and tell them to get dressed!” My attitude to dressing children came from my experience with boys who never once questioned my wardrobe selections. Then along came my daughter and now I’m eating my words. Getting my daughter dressed is challenging. If I pick out pants, she wants a skirt. If I pick out yellow, she wants red. With patience wearing thin, I took the ‘choose your battles’ approach and left her to her own wardrobe choices. That’s how I discovered that a two-year-old determined to wear a gold tutu with stripy tights and sandals to school drop-off somehow manages all the buttons, straps and zips on her own. So I used the only strategy I had left – limit the choices to simple but beautiful clothing and she can’t go too far wrong. Needless to say when I came across the co-ordinating range of girls separates by Little Pea, I was excited. Little Pea is created by Sara McMahon, a mother of two daughters who knows that style and function must go hand in hand. 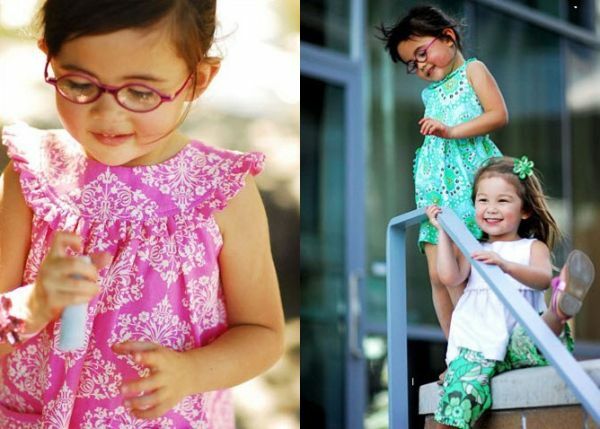 The Little Pea collection features bright modern-retro prints, simple silhouettes and girlish details that add up to pieces that transition perfectly from a play in the park to dinner out. There is a strong emphasis on styles that are easy for children to get on and off themselves – big buttons, generous arm holes and pull-on pants. The fabric prints are exceptional – bright, crisp green, a shade of pink that hits the mark and chambray and denim options that coordinate with everything. The unique prints makes everything in the Little Pea range look extra-special but I particularly love the Capri pants, the pretty, blousy Lucy tunic top and the classic Byronie dress. So with Little Pea in the wardrobe I can be sure that my daughter’s look will be beautifully co-ordinated and she will be happy that her forty-odd costume changes during the day are quick and easy. Buy directly from Little Pea. Prices range from US$38 – $58. Little Pea ships internationally.